Jayson Tatum scores 24 points as Boston comes back from a 16-point halftime deficit. OKLAHOMA CITY — Jayson Tatum scored 24 points, and the Boston Celtics rallied from a 16-point halftime deficit to beat the winless Oklahoma City Thunder 101-95 on Thursday night. Paul George scored 22 points for Oklahoma City, but shot just 7 of 22. Russell Westbrook had 13 points, 15 rebounds and eight assists, but he shot 5 for 20. The Thunder and Cleveland Cavaliers are the only winless teams in the league. Morris hit a 3-pointer with 27 seconds left to give the Celtics a 98-95 lead, and they held on. Oklahoma City led 50-34 at halftime. Boston shot just 32 percent in the first half and missed all 11 of its 3-point attempts. Boston hit seven of its first 10 3-pointers in the third quarter to trim Oklahoma City’s lead to 70-64. At one point, Horford hit three 3-pointers in 41 seconds. Morris hit a 3 to cut Oklahoma City’s lead to 72-70, and a steal and layup by Terry Rozier III tied the game. Morris made a layup late in the quarter to give the Celtics a 74-73 lead at the end of the period. Boston made 9 of 14 3-pointers in the quarter. The Thunder went up 86-83 on a layup by rookie Hamidou Diallo. 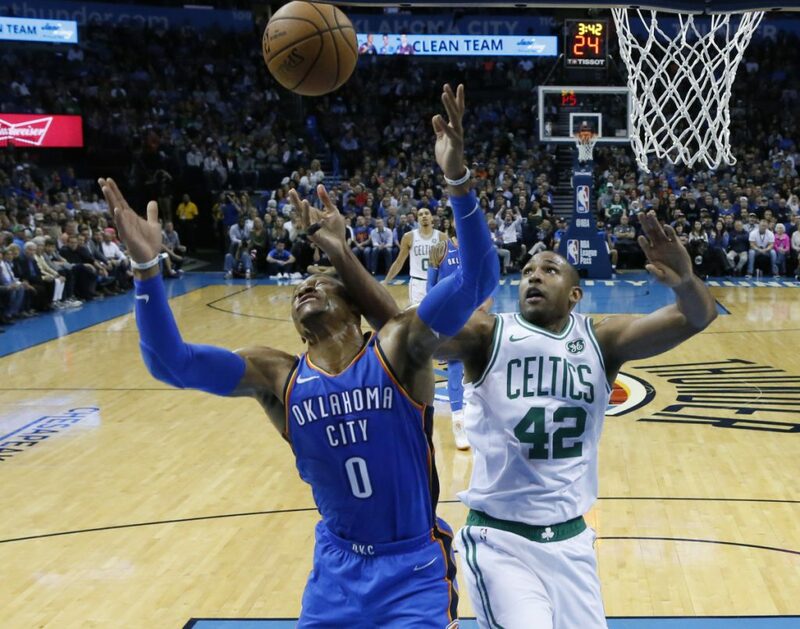 Westbrook found Alex Abrines for a 3-pointer with just over five minutes to play, then Abrines hit another 3 on Oklahoma City’s next possession to push the lead to seven before the Celtics rallied. NOTES: F Gordon Hayward scored five points in 24 minutes. He hasn’t played more than 25 minutes this season as he tries to find his way on his surgically repaired left ankle. … C Aron Baynes (right hamstring strain) and G Jabari Bird (personal reasons) did not play. … Morris committed three fouls in the first quarter in just 6:50 of playing time.